The deadline is approaching slowly, stealthily. You may not even realize it until the shelves of your local hardware store are void of 40-, 60-, 75- and 100-watt standard incandescent light bulbs. Congress ordered them phased out in 2007, and manufacturers stopped making them as of Dec. 31, so when they run out depends on your store's inventory and the continuing allure of Thomas Edison's 135-year-old invention. What will be different is the incorporation of costlier energy-efficient light bulbs into the showcase. At Home Depot, for example, their prices will run from $2.19 for a 60-watt-equivalent compact fluorescent lamp (CFL) to $64.98 for a 40-watt-equivalent light-emitting diode (LED). 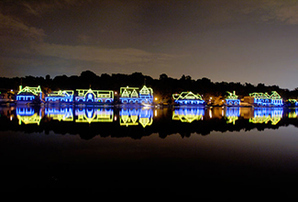 In 2006, property managers at Boathouse Row in Philadelphia converted from incandescent bulbs to this fancy LED lighting system, including flexible strands that contained more than 12,000 full-color LED nodes. Annual electricity savings and labor savings in replacing bulbs come to $57,000 a year. Photos courtesy of Philips N.V.
Now comes the math: Although the $64.98 LED is 100 times the price of the modern version of Edison's bulb, the new bulbs are still a bargain for the consumer, the United States and the climate. As Kyle Pitsor, vice president for government relations at the National Electrical Manufacturers Association, explains, CFLs are 75 percent more efficient and LEDs 85 percent more efficient than a traditional incandescent light bulb. Lighting in residential homes is about 12 to 15 percent of an average home electrical bill, so the electricity savings to consumers are not trivial. Moreover, power-saving bulbs last longer, so you will not have to make as many trips to the store. According to University of Kentucky lighting design professor and American Lighting Association consultant Joe Rey-Barreau, standard incandescent bulbs last an average of 1,000 hours, whereas CFLs last 10,000 hours and LEDs an astonishing 25,000 to 100,000 hours. 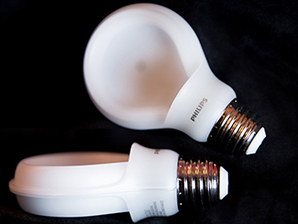 "We actually have a going joke in the lighting industry that, if you buy one of these LED bulbs and you put it in your house when you have a baby, when they're coming back from college you might want to replace it," said Philips spokeswoman Silvie Casanova. Instead of simply deciding which wattage of standard incandescent to purchase, consumers will be faced with a diverse range of energy-efficient bulbs that have contrasting qualities, features and purposes in addition to various lumens per watt. There are now power-saving substitutions for traditional incandescent bulbs as well as LEDs, CFLs and halogens, a type of incandescent with a tungsten filament. "Lighting today is getting very difficult for consumers because there are so many choices, so many variables, so many things that are new and different," Rey-Barreau said. The sixth annual "Socket Survey" from lighting company Osram Sylvania found that as a result of the legislation, 46 percent of consumers plan to switch to CFLs, 24 percent to LEDs and 13 percent to halogens. CFLs have some drawbacks. According to U.S. EPA, each CFL bulb contains about 4 milligrams of mercury. The concern is that, once broken, the bulb will emit potentially hazardous mercury vapor into the surrounding environment. A 2011 study published in the journal Environmental Engineering Science by Jackson State University researchers Yadong Li and Li Jin revealed that mercury contents in CFLs vary significantly by brand and wattage, from 0.17 milligram to 3.6 milligrams. The study found that the "vast majority of CFLs are nonhazardous" and that it would take weeks or even months for the mercury vapor released in a room to exceed the safe human exposure limit. In addition to this shortcoming, the CFL bulb -- along with the energy-efficient incandescent bulb and halogen bulb -- has reached its pinnacle of efficiency, according to Rey-Barreau. And Peter Soares, the consumer category director at Philips, has a similar outlook. "I think both the energy-saving incandescent and CFL will hit a peak sometime in the coming couple of years," he said. Their bottom line: The LED is currently the most promising light source being sold on the consumer market. "The lack of mercury, the efficiency, the good color, the fact that it produces very little heat -- those are all benefits of the LED," Rey-Barreau said. According to Philips' director of LED products, Todd Manegold, it wasn't until five or six years ago that the LED was looked at as a viable light source for everyday use. "Today LEDs are in just about everything," he said, "and so we see the transition where adoption of LED is happening in different stages by different industries and with varying uses." A $9.97 Philips LED bulb. The LED's allure as a household light source has to do with its cutting-edge construction, which consists of an array of individual light-emitting diodes, allowing consumers to do new things, such as digitally control the lighting in their homes through the Internet and mobile phones. And LED bulbs are no longer limited to producing a harsh white-blue light. In fact, Manegold considers the light emitted from current LED bulbs to be the "closest representation" to the warmish light that's typically radiated from traditional incandescent bulbs. While the price of LED bulbs has decreased in the past five years, there will be a continued drop in price as the semiconductor technology improves and electronic costs are reduced, according to Pitsor of the National Electrical Manufacturers Association. Furthermore, many of today's LED bulbs meet the Energy Star program's efficiency requirements, making them eligible for utility rebates that will, in turn, decrease their overall retail price. Philips created its newest LED bulb, SlimStyle, with this in mind. Even though SlimStyle is $9.97 today, Casanova expects that utility rebates will kick in to reduce the price by Earth Day (April 22). "Will LED bulbs ever be as low as 60 cents? I don't think so," Manegold said. "People have to be willing to think a little bit about total cost of ownership rather than initial price. "Our goal is to make the LED affordable to the everyday person so that it's not something you have to think two, three times about; it's something that, when you have to replace a light bulb, you say, 'OK, yeah, that's something I can afford.'" In addition to its dropping price and energy savings, the LED creates U.S. manufacturing jobs. An LED forecast for 2013 to 2019 predicted that the LED lighting market will grow 45 percent per year through 2019 -- a trend that has U.S. light bulb manufacturers considering ways to make more LEDs at home. "Many LEDs are manufactured in China, but there is a significant presence of LED manufacturing in the U.S.," Rey-Barreau said. According to the Department of Energy, making them domestically brings research-and-development labs and manufacturing plants closer together, which allows for more timely innovation and better quality control. And the LED manufacturing process can be fully automated, eliminating the need to hire inexpensive overseas workers. Some lawmakers argue that government should not dictate consumers' light bulb choices. The recently passed 2014 omnibus appropriations bill includes an amendment prohibiting DOE from enforcing energy-efficient light bulb standards. However, the Alliance to Save Energy's director of government relations, Elizabeth Tate, believes consumers will sort it out. "I think that as the market becomes saturated with energy-efficient bulbs, and more consumers experience them, most people will recognize the energy savings that they're getting and will adapt to them. "I'm sure families would rather spend $100 on dinner than on their lighting bill."